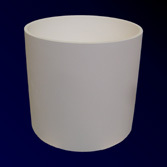 The main ingredient of CoorsTek’ silicon polycrystalline silicon melting crucibles is high purity melted silica. They exert minimum impact on polycrystalline silicon because they are resistant to thermal shocks and highly pure. They are susceptible to little size changes during molding, thanks to a special molding method that is used in their manufacture. They are therefore capable of accommodating large sizes and complex shapes.